More fun and greater challenge by 3! 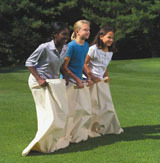 Add a whole new hilarious dimension to sack races with this hop sack that has room for 3 children!. A great exercise in coordination, cooperation, agility and fun! Huge, heavy-duty canvas sack features an individual, roomy ‘hop pocket’ for each person. Sack measures 210cm L x 88cm H. Each pocket measures 70cm.